It can be difficult to come up with unique costume ideas. As soon as you think you've come up with something clever, you usually find someone else who had the same idea. The key to finding something out of the ordinary is to look beyond the costume store and brainstorm for fun characters or unique ideas. Standing out in a crowd can demand attention, ensuring you that you will score a lot of candy and prizes. Playing with puns is a fun and easy way to come up with a costume that's out of the ordinary. You've probably seen someone dressed as a black-eyed pea (sweat suit with a P on the end and black under one eye), but if you think about common phrases and household items you can probably come up with other plays on words that haven't been done before. Find a simple blue dress with apron, similar to the character of Belle from Beauty and the Beast. 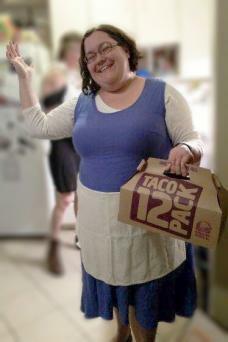 Add a take-out box from a well-known taco joint and you are now "taco Belle." Wear a brown sweat suit to resemble mud. Optionally, you could wear a white sweat suit splattered with brown paint or mud. Tape a stick to your suit. 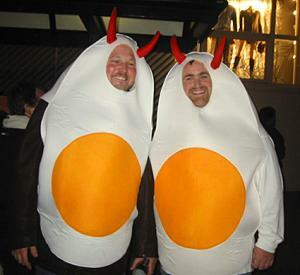 Wear a white sweat suit with a yellow "yolk" painted on. You could also cut a large circle out of yellow felt and pin or sew it on your suit. Wear devil horns and carry a pitchfork to complete the look. Don a pink sweat suit and devil horns. A devil tail and pitchfork are optional accessories that add to your devilish allure. You can also print the word "Ham" on the front of the shirt to help identify the costume. Simply tape a doll to the rear end portion of some pants; you could also put a smaller doll into your back pant pocket. Be sure to wear a belt so the extra weight doesn't drag down your pants. 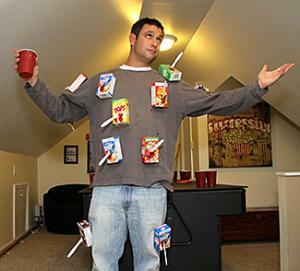 Tape an assortment of cereal boxes to a sweat suit. For added effect, splatter your sweat suit and some of the boxes with red paint or fake blood. You can also carry a toy knife and a spoon to complete the look. Pin clothing and fabric softener to a sweat suit. Use gel to spike your hair, adding to the electric look. Go to any Halloween Express or Spirit Halloween store and pick up a doctor's lab coat, a stethoscope and one of those headband mirrors. Now find some peppers and pin them to the coat. Dress like a surfer, including a bad blonde wig, a surfboard (you can get a cheap boogie board from a dollar store), shorts and a pair of water shoes. Attach fake cobwebs and some keys from an old keyboard to the clothes, or simply carry a keyboard. Pin some old sofa cushions or pillows to an old shirt. Eat chips and attach some small, empty chip bags to the cushions. Get creative and cover your cushions with some double sided tape so as you eat the chips you can easily attach a new bag like you are stuffing it between the seat cushions. One of the most fun ways to come up with unique Halloween costumes is to look for an incident in the news or a celebrity who has gotten in trouble to use as the basis for your costume. Any celebrity who has gotten arrested in the last year is good fodder for this type of costume. There are a couple different ways you can handle this one. You can dress up as the celebrity and then add a prisoner number to your outfit. You could also wear the traditional black and white prison stripes. Wear something to identify yourself as the celebrity, whether that is her trademark hairstyle, oversized sunglasses, or even a name tag. Search online for the famous mug shot, print it out and attach it to your costume so you'll be more easily recognized. To dress as a politician in trouble, wear a suit and an appropriate prop related to his downfall. For instance, a costume involving former congressman Bob Ney, who resigned as part of the Jack Abramoff scandal, might include filling all your pockets with fake money, carrying golf clubs (since he famously went to St. Andrews with Abramoff) or wearing a pin that says #1 (since he was known as Representative #1 in the investigation). Print some pictures of a male and female celebrity who have started dating or gotten married and carry them around with you. Wear an adult diaper and a bonnet. For instance, carry a picture of Brad Pitt and Angelina Jolie and put them in frames to carry around with you and go as "Baby Brangelina." A costume like this ensures you'll learn which of your friends read the tabloids or gossip sites! Science fiction and fantasy movies- Movies like Stardust are a great source of inspiration. Consider wearing a name tag to help identify the costume. 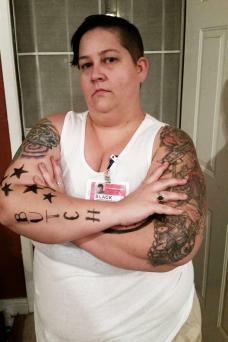 Television shows- Dressing like someone from a television show, like Orange is the New Black, may mean wearing normal clothes and adding an accessory or a name tag so everyone can identify it. Vintage or retro movies- Dress as a favorite character from a long-ago movie such as a munchkin from The Wizard of Oz. Movie title- Choose the title of a movie and dress accordingly. For instance, wear a purple sweat suit and go as The Color Purple. Unique take on a common character- Turn Hannah Montana or another famous character into a zombie, vampire or other type of undead monstrosity. Inspiration for a great costume can come from anywhere. 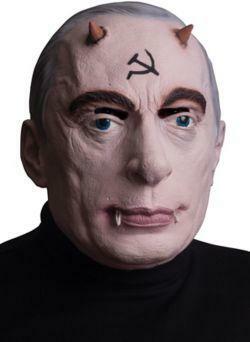 Turn a well-known politician into a scary Halloween version by making him or her a vampire, witch, or demon. Or dress as "Sloth for President." The lovable gentle giant from the Goonies running for office may get a laugh from friends. Dress like the hottest toy or the newest electronic device. Use a large box with arm holes cut into it to go as an iPod or other handheld device. Creating a clever costume doesn't have to involve being a creative genius or spending tons of money. There are a lot of things you can use in the world around you. Just use your imagination and lose some of your inhibitions, and you're on your way to an unforgettable costume.